Though people laughed at his soon-to-be floating zoo, Noah trusted and obeyed what the Lord said. 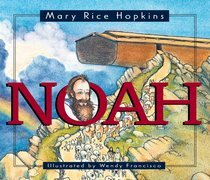 Now this great Bible story about God's protection and Noah's faith comes to life for kids through Mary Rice Hopkins' winsome lyrics and Wendy Francisco's charming illustrations. Celebrating 25 years in family music ministry, the unique songs of singer/songwriter, Mary Rice Hopkins have captured the hearts of children and grown-ups alike. Mary is also known for keynote speaking and leading worship at events such as MOPS, Moms In Touch Int'l, Women's Retreats, ACSI (Assoc. Of Christian Schools Int'l), CPC (Children's Pastor's Conference), and many other educational conferences. You've heard her works with Group Publishing, Cook Ministries, Crossway Books, Harvest Crusades, Time Life's Praise & Worship Series, Maranatha! Music, and more.